Modern Barns are particularly appropriate in agrarian communities. A barn form honors that tradition, while housing very modern lifestyles. One aspect of a barn's appeal is that inside one simple volume there are a variety of different spaces: a soaring full-height volume, a living loft that is tucked under the barn roof, and under that loft, cozy more intimate space with a flat ceiling overhead. Barns structures are efficient to build. Four corners and a simple roof that runs the full length of the building. That efficiency helps control the cost without reducing the excitement of the interior. This modern barn in a rural community east of Seattle sits on a gently sloping pond-view site. The recently married clients plan their first home together. Their mission is to create a warm and relaxing home, filled with light and interest, efficient in initial and operating costs. The three level home includes three private zones and a wide range of room scale. Laminated Douglas fir girders maintain human scale in the soaring two story great room. A large island kitchen and dining room with flat ceiling overhead are a more intimate in scale. A quiet one-person reading retreat completes the range of scale. Above the kitchen and dining areas, the owners’ suite is up under the wood lined roof with dormers to add height at the outside walls. The suite overlooks the great room and out to the view. At the end of a linear dressing hall, a small hidden office enjoys a woodland view. 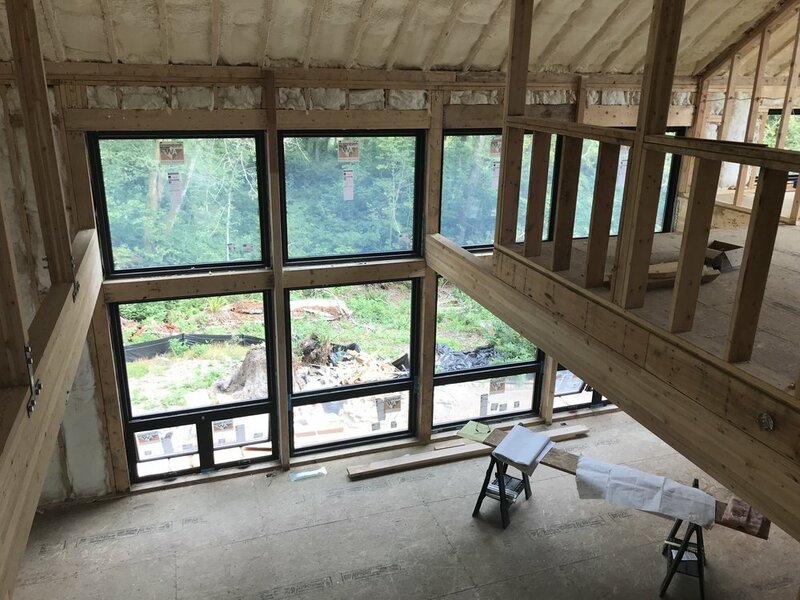 The site’s topography is perfect for a large daylit walkout basement that will contain two bedrooms and a large billiard and family room and a large craft room. Moved away from the expansive window wall to avoid obstructing the view, a covered deck on one provides outdoor cooling and dining space year-round. A simple single volume containing 2500 square feet of living area will be completed at the cost per square foot of our recent projects. The corrugated steel and cement board sidings will minimize maintenance costs. The upper levels, while energy cost on the lowest level will be minimal as a result of the earth beaming on three sides. Efficient to build and with lower lifecycle costs, the home will provide comfortable and relaxed living second to none. Let the sunshine in! Morning sun in the great room! Now sheetrocked, the great room takes shape. Laminated girders and roof beams to the fore!